1. Mix ginger and garlic with mutton. 2. Leave for 15 minutes. 3. Fry onions in hot ghee. 4. Separately fry potatoes to a golden colour and then remove. 6. Mix the spices with mutton and add curd. 7. Add to onions and ghee. 9. When the liquid of curd and meat dries, continue frying till brown. 10. If the masala sticks to the pan, sprinkle a little water, stir well and continue to brown well. 11. Add the fried potatoes and cook together for a few minutes, sprinkling a little water if necessary. 12. Add 4 cups of water to cook the mutton. 13. Add 2 to 3 cups for gravy later, if required. 14. Cook till the mutton is half done. 16. Add 2 powdered cardamoms, a pinch of caraway seeds and salt. 17. Cook on low heat till ghee comes to the top. 18. Serve hot with rice or roti. 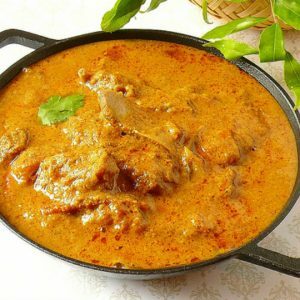 Feel free to comment or share your thoughts on this Mutton and Vegetable Korma Recipe from Awesome Cuisine.